Manually adding products is the most efficient way to add a small amount of products. Sherpa Tip: Always search for variations of the product’s description, including misspellings, before adding the product. From the Ascend Desktop, click the Products tile. Description: Enter the product’s description. If the product is ordered by the case and sold individually (e.g. energy gels, protein bars), do not include the case quantity. Brand: Enter the brand for the product. UPC: Enter the UPC or EAN for the product. If the product is ordered by the case and sold individually (e.g. energy gels, protein bars), enter the UPC for an individual item. A maximum of 14 characters can be entered.Sherpa Tip: Enter a UPC or EAN for all non-proprietary products. Keyword: A short description is automatically generated. If desired, enter a new value. This value is printed on receipts, and a maximum of 25 characters can be entered. Estimated Time: For labor items, enter the amount of time (in minutes) the work generally takes. This is used on Work Orders to automatically populate the amount of time a repair is expected to take. Color: Enter the color name for the product. SKU: And in-store SKU is automatically generated. 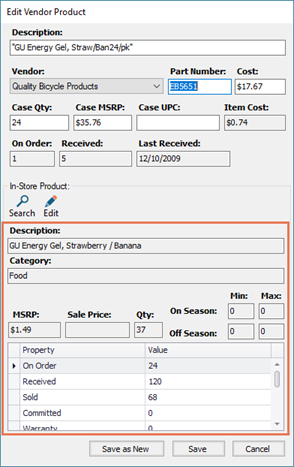 If desired, enter a new store-specific code for the item. A maximum of 14 characters can be entered. Size: Enter the size for the product. Manufacturer’s Part Number: Enter the part number assigned by the manufacturer.Sherpa Tip: This part number may not be the same as assigned by the vendor. Estimated Cost: Enter the approximate wholesale cost for the product. If the product is ordered by the case and sold individually (e.g. energy gels, protein bars), enter the cost for an individual item. Other: Enter any additional information for the product as required. Style Number: Enter the style number assigned to the product. Style Name: Enter the style name assigned to the product. Year: Enter the model year for the product. Gender: Enter the gender the product is designed for. Season: Enter the season the product is designed for. Hidden: Check if the product should be inactive and hidden from normal searches. Non Inventory: Check if the product should not have its quantity on hand tracked (e.g. labor items). eCommerce: Check if the product should be included in exports (uploads) to your eCommerce website. Do not upload label info: Check if the product should not be included in uploads to Trek and/or QBP labeling programs. Multi-store retailers: This tab displpays your location's Short Name. Quantity: The quantity of the product on hand in your store. This value cannot be entered manually. If the product is ordered by the case and sold individually (e.g. energy gels, protein bars), the number of individual items displays. 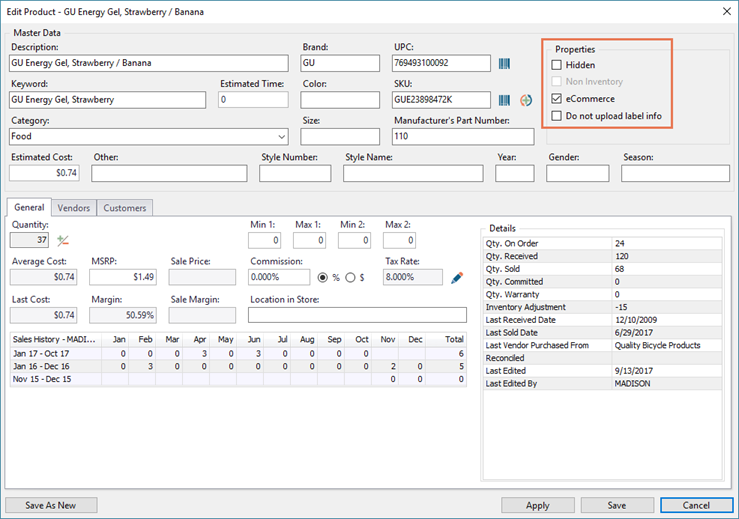 Min 1: Enter the lowest volume of product stocked during your primary season. 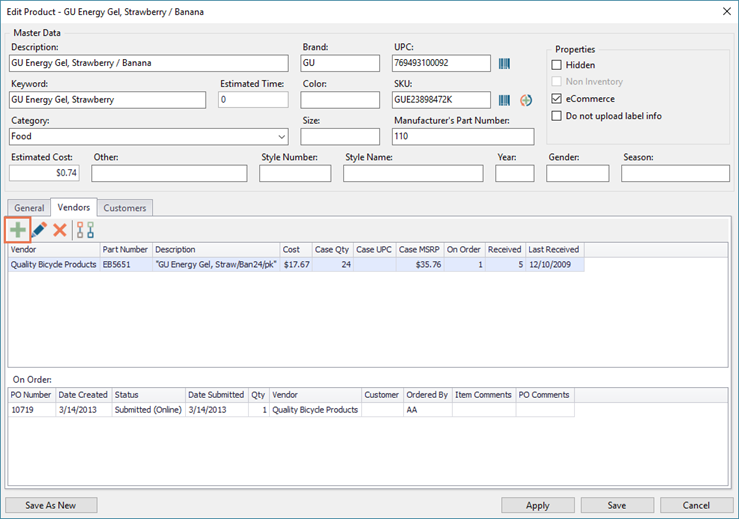 When a product’s quantity falls below the minimum, the product is flagged in the system as requiring reorder. If the product is ordered by the case and sold individually (e.g. energy gels, protein bars), enter the number of individual items required. Max 1: Enter the highest volume of product stocked during your primary selling season. The maximum is used to calculate how much product must be reordered: Maximum minus Quantity On Hand equals the amount of product that requires reorder. 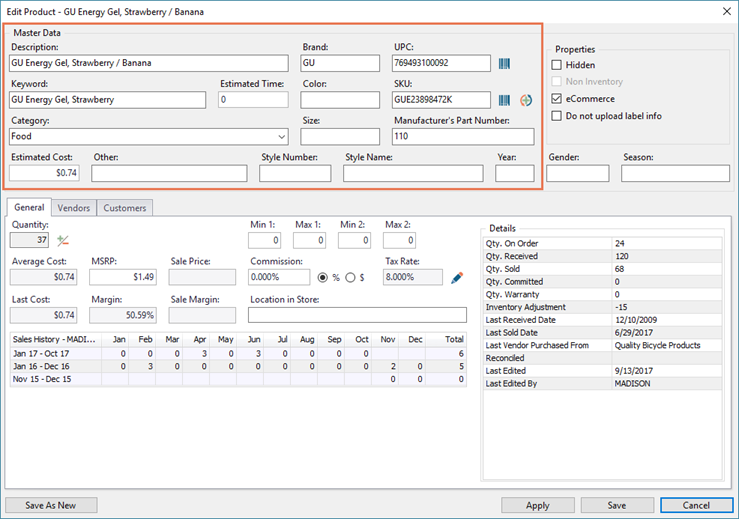 Min 2: Enter the lowest volume of product stocked during your “off” or secondary season. When a product’s quantity falls below the minimum, the product is flagged in the system as requiring reorder. Max 2: Enter the highest volume of product stocked during your “off” or secondary selling season. The maximum is used to calculate how much product must be reordered: Maximum minus Quantity On Hand equals the amount of product that requires reorder. 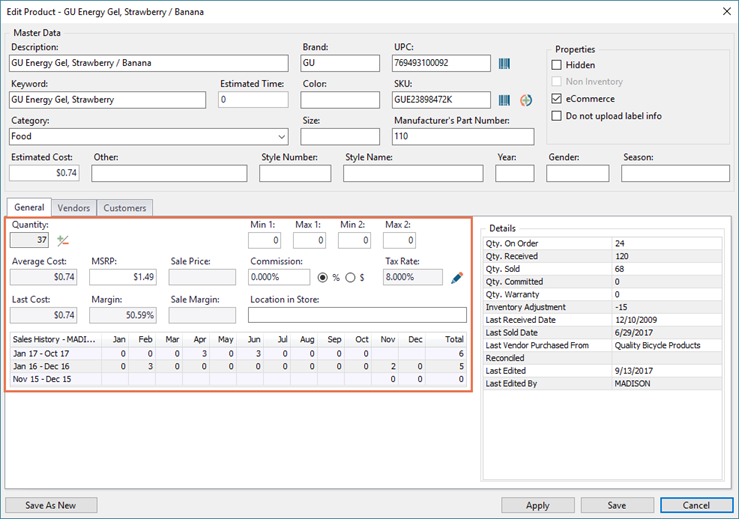 Average Cost: This field automatically calculates based on receiving and inventory adjustment history. If the product is ordered by the case and sold individually (e.g. energy gels, protein bars), the cost for an individual item displays. MSRP: Enter the selling price for the product. If the product is ordered by the case and sold individually (e.g. energy gels, protein bars), enter the MSRP for an individual item. Sale Price: This field automatically calculates based on the lowest price the product is on a sales promotion for. Commission: Enter a percentage or dollar amount which users are awarded for selling the product. Select the appropriate % or $ option. Tax Rate: The current tax rate applied to the product displays. To override the default tax rate, click the pencil icon and enter the appropriate rate in the Product column. Last Cost: The last cost the product was received for automatically displays. If the product is ordered by the case and sold individually (e.g. energy gels, protein bars), the cost for an individual item displays. Margin: A product's margin is the difference between the cost and the selling price of the product. If the product is ordered by the case and sold individually (e.g. energy gels, protein bars), the margin for an individual item displays. Sale Margin: The margin based on the product’s sale price displays. If the product is ordered by the case and sold individually (e.g. energy gels, protein bars), the margin for an individual item displays. 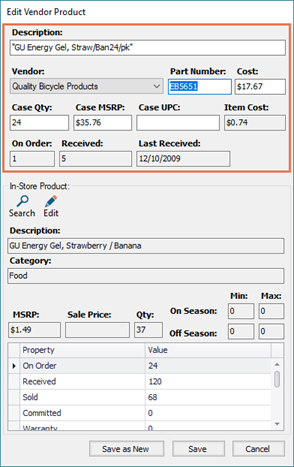 Location in Store: Enter the location in the store where the product is stored. Description: Enter the description from the vendor. If the product is ordered by the case and sold individually (e.g. energy gels, protein bars), include the case quantity. Vendor: Select the vendor who the product is ordered from. Part Number: Enter the part number as assigned by the vendor. Cost: Enter the cost from the vendor. If the product is ordered by the case and sold individually (e.g. energy gels, protein bars), enter the cost for the entire case. Case Qty: If the product is ordered by the case and sold individually (e.g. energy gels, protein bars), enter the quantity of individual items in the case. Case MSRP: If the product is ordered by the case and sold individually (e.g. energy gels, protein bars), enter the selling price for the entire case. Case UPC: If the product is ordered by the case and sold individually (e.g. energy gels, protein bars), enter the UPC for the entire case. Item Cost: The cost for an individual item displays. On Order: The number of items on open orders which have not been received displays. If the product is ordered by the case and sold individually (e.g. energy gels, protein bars), the number of cases on order displays. Received: The number of items which have been received on past orders displays. If the product is ordered by the case and sold individually (e.g. energy gels, protein bars), the number of cases received displays. Last Received: The last date on which the product was received displays. Information on the associated in-store product displays.